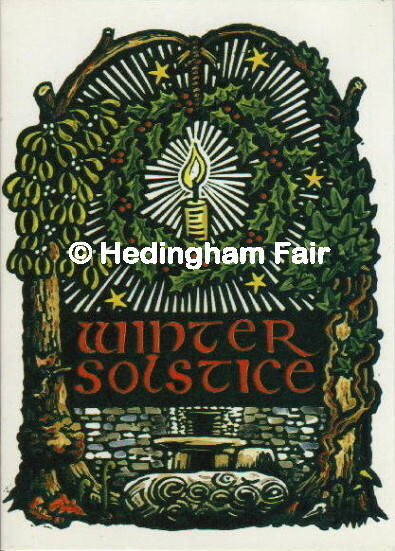 The Winter Solstice, December 21st, the shortest day, is the turning point of time and the birth of the sun. It is a time of new beginnings when all nature prepares to traverse the threshold into a New Year. The great mound known as Brugh Na Boinne (Newgrange) in County Meath, Ireland (shown at the bottom of the illustration) was constructed 5,200 years ago, before the Egyptian pyramids. It is made up of 450 huge boulders as well as an infinite number of smaller stones, and could have taken forty years to build. At dawn on Midwinter's Day the central chamber at Newgrange, where the love god Oenghus was said to reside, is piereced by a single shaft of sunlight, which strikes the stone slab at the back of the chamber. In the following moments it widens and climbs upwards, illuminating the chamber's carvings - circles, spirals and zigzag patterns. The light signifies the return of the sun in the depths of winter, entering the being of the earth and promising light and warmth to come with the New Year.